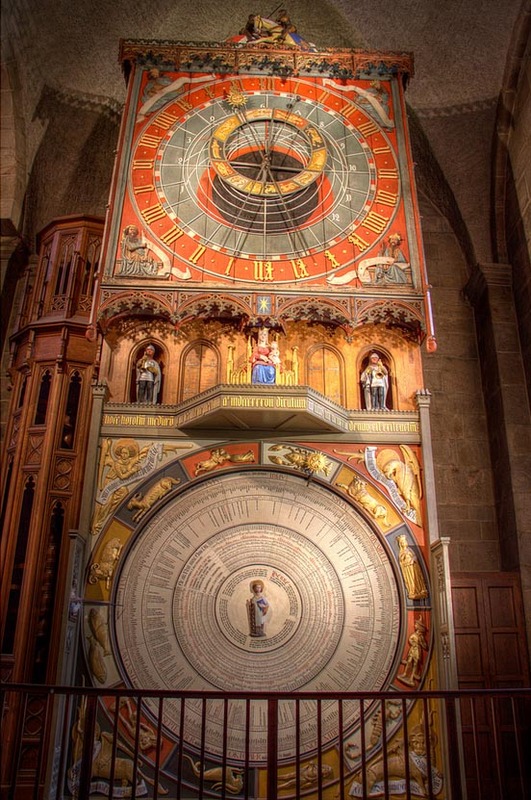 The 9 metre tall clock is installed in the cathedral of Lyon. An astrolabe indicates the date and position of the moon, sun, and earth, as well as the stars. 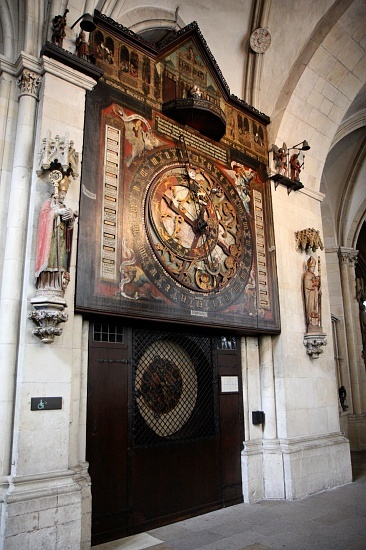 The first documentary evidence of an astronomical clock in the cathedral is from 1383 but this was destroyed in 1562. In 1661 it was reconstructed by Guillaume Nourrisson. During the French Revolution, all royal insignia was removed. The last restoration in 1954 reset the clock’s perpetual calendar of 66 years. It will be accurate until 2019. The central tower octagon supports several automated figures. After the angel on the left turns the hourglass, an angel on the right keeps the time for the three angels who strike bells to sound the hymn of Saint Jean-Baptiste. The Virgin Mary kneels in a chapel, and turns to the Angel Gabriel as he opens the chapel door, while a dove descends, representing the Holy Spirit. A Swiss Guard rotates around the dome. Movement stops at the sounding of the hour. In a western niche, a statue rotates at midnight. On Sunday, it is Jesus resurrected; Monday: his death; Tuesday: St. John the Baptist; Wednesday: St. Stephen (patron saint of the ancient basilica) holding the palm of martyrs; Thursday: a child with chalice and host; Friday: a child with the symbols of crucifixion; on Saturday: the Virgin Mary. The astronomical clock of Lund Cathedral, the Horologium mirabile Lundense, was constructed c. 1380. After having been in storage since 1837, it was restored and put back in place in 1923. On top of the clock there are two knights that mark the hours. 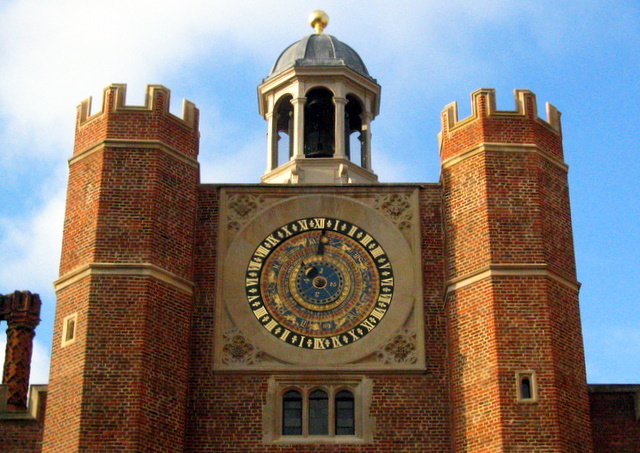 The upper board of the clock is the astronomical clock. It shows, among other things, the different phases of the Moon and where the Sun sets. The lower board of the clock is a calendar. With the help of it one can, among other things, calculate when different mobile religious holidays will fall and on which weekday a certain date will fall. In the middle of the calendar stands Saint Lawrence, the Patron Saint of the Cathedral, and by his side the Symbols of the Four Evangelists. The present board of the clock goes from 1923 to 2123, after that a new one must be obtained so that the clock can be used. Strasbourg Cathedral de Notre-Dame is known as one of the most beautiful gothic cathedrals in Europe. The Cathedral stands on the exact site of a roman temple built on a little hill above the muddy ground. The first version of the church was starting to be built during 1015 by proposal of Bishop Werner von Habsburg, but fire destroyed most of the original Romanesque building. By the time that cathedral was being renovated (at the end of the 12th century, this time with red stones carried from the nearby mountains of Vosges), the gothic architectural style has reached Alsace and the future cathedral was starting to develop all characteristics of gothic aesthetics. The project of the first cathedral in Alsace was handed to craftsman and stonemasons who had already worked on the also famous gothic cathedral in Chartres. With the construction of the west front, the cathedral obtained its earliest known display of astronomical time—one that the cathedral shares with many other large churches—the carved reliefs depicting the signs of the zodiac and the labours of the months in the bases of the statues flanking the right portal. Occupations of the months and signs of the zodiac, west façade, right portal—May, Gemini; June, Cancer; July, Leo; August, Virgo. 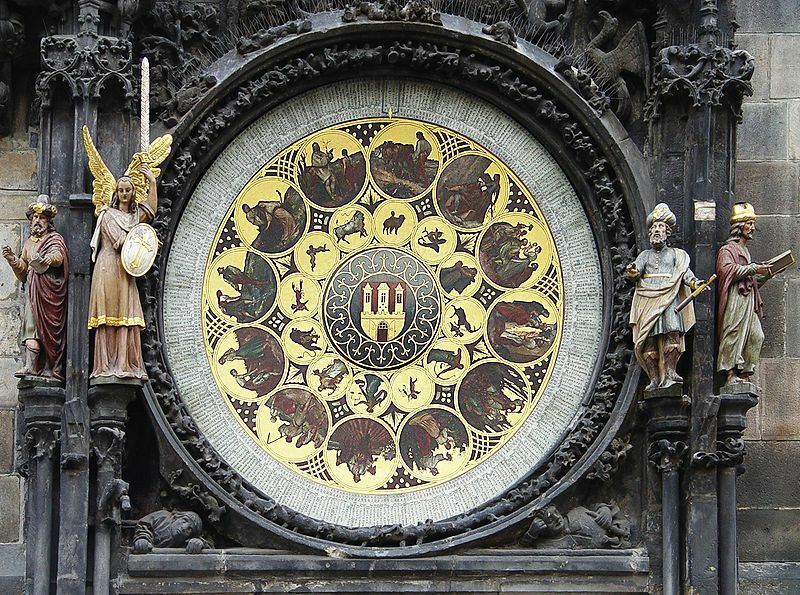 The most widely known of these astronomical displays of are the cathedral’s elaborate astronomical clocks. 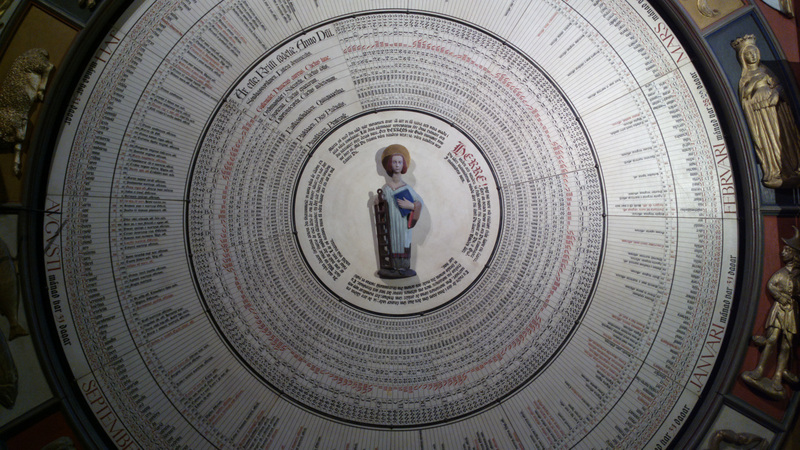 The 14th-century clock included a calendar, a mechanically driven stereographic projection showing the movement of the stars, and pointers showing the positions of the Sun and Moon. Atop the clock was an automaton of a cockerel, which crowed at noon, flapping its wings. 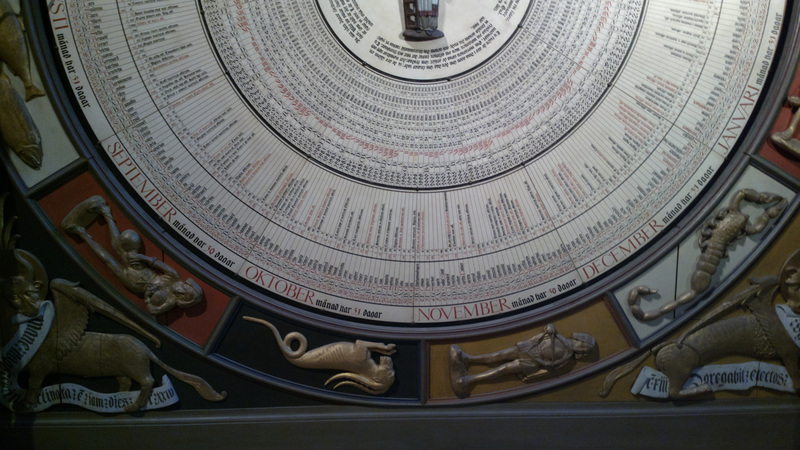 The 16th-century clock added to these elements a rotating celestial sphere on which were depicted all 1020 stars of Ptolemy’s star catalogue together with figures of 48 constellations, a disc showing the ecclesiastical calendar for 100 years, and depictions of all eclipses over an interval of 32 years. A stereographic projection of the stars, Sun and Moon, like the one in the original clock, was enhanced with additional pointers showing the positions of all the visible planets and the Dragon, or lunar node, which served to explain eclipses (Fig. 2). Elements of the case and display were incorporated into the current clock. Although the clock reflected the geocentric model of astronomy, its decoration included a portrait of Nicolas Copernicus. 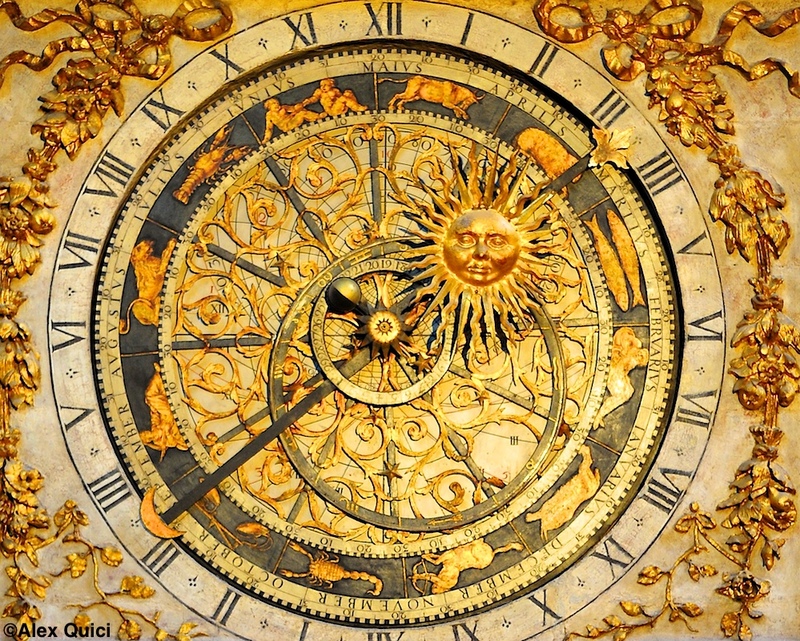 The 19th-century clock reflected Copernican astronomical concepts. The geocentric stereographic projection of the Sun, Moon, and planets was replaced by a heliocentric model of the visible planets, plus the Earth and Moon, in the solar system. It displayed both uniform civil time and the apparent time indicated by the daily motions of the Sun. The stellar globe now portrayed more than 5000 stars, extending down to faint sixth magnitude ones. 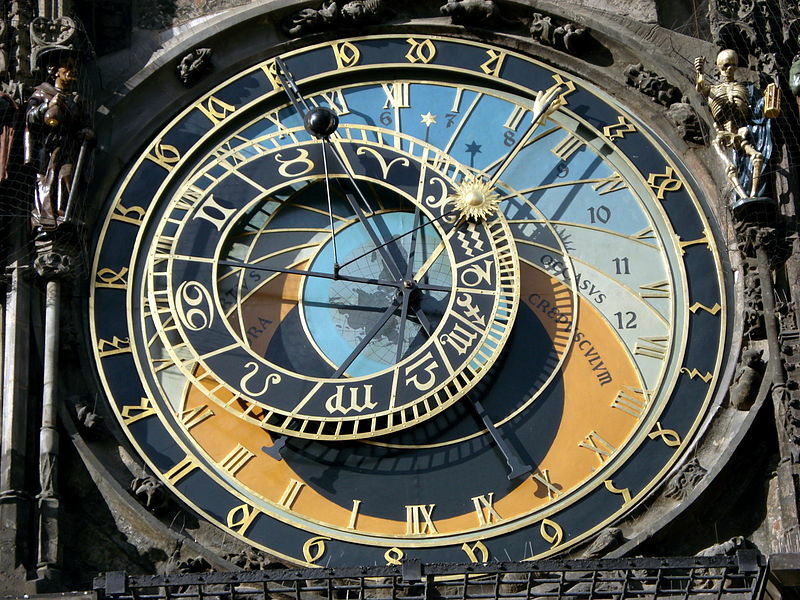 In addition, the clock incorporated a perpetual calendar, computing the solar cycle of 28 years, the lunar cycle of 19 years, the date of Easter, and other calendrical parameters traditionally found in ecclesiastical computus. 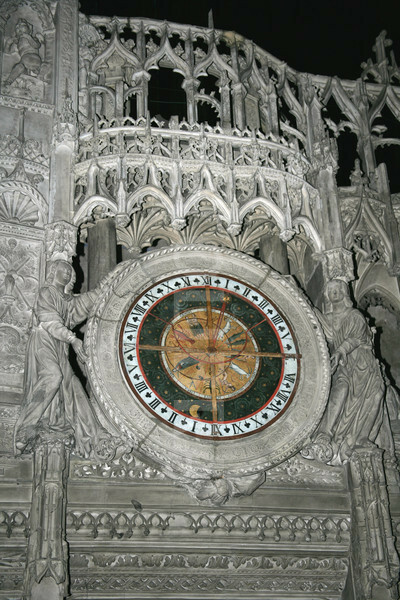 The concern with time that we see in the cathedrals clocks also appears in its fourteen sundials, which date from the 13th to the 18th centuries. The oldest sundial, dated between 1225 and 1235, marks seven times of prayer in the course of the day, beginning at dawn and continuing until sunset. The 15th century saw the addition of three more sundials, dividing the day into twelve hours from sunrise to sunset. In the 16th century, five dials were installed at the platform level of the tower and three mathematical dials, designed by the builder of the second clock, were installed on the gable of the south transept. The builder of the 19th-century clock, Jean-Baptiste Schwilgué, installed a vertical meridian line inside the entrance to the south transept, marking local apparent noon to regulate the clock. Astrologer with a sundial, south portal. Three sundials on south gable: altitude/azimuth dial (left), vertical sundial (centre), and dial reading hours from sunrise and sunset (right). The display of astronomical time was central to the cultural uses of astronomy in medieval Europe. 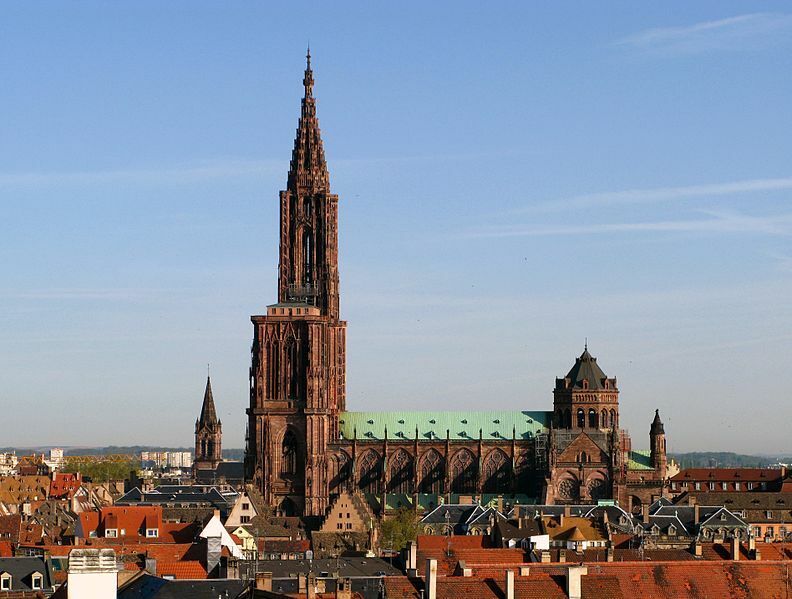 Strasbourg cathedral, which was the ‘principal element of the nomination’ for the World Heritage Site Strasbourg–Grande Île, embodies these astronomical concepts in three ways. 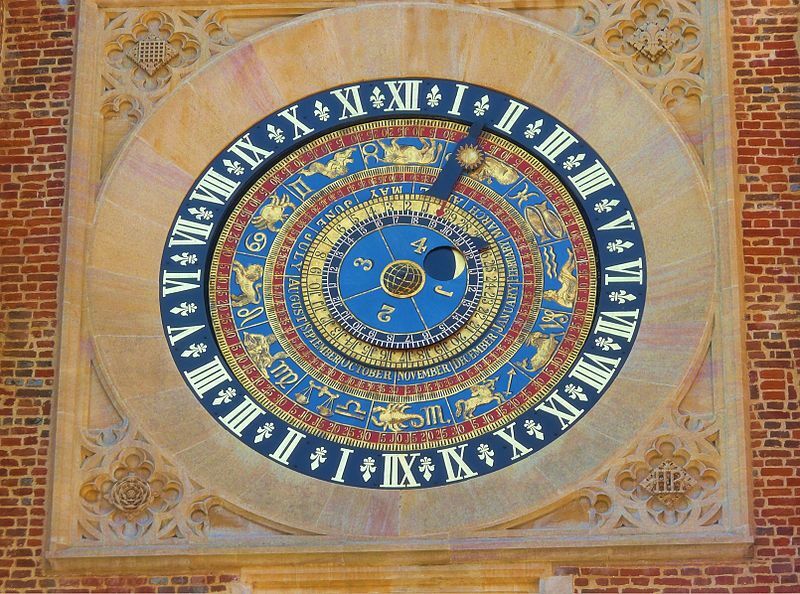 Symbolically, the cathedral’s sculptures bind the zodiac to the labours of the months; at a more direct practical level the cathedral displays astronomical time in numerous sundials; and—perhaps most famously—there is the historical sequence of its three great astronomical clocks. Notwithstanding this, the description of the attributes of value of the property—both in the ‘justification of value’ from the State Party and in the ICOMOS evaluation—takes a classical heritage approach, elucidating this exceptional Gothic church in terms of the history of art, the history of structural design, the history of urban construction, and the history of medieval Christianity, but does not elaborate at all on the astronomical features of the place. The most famous feature of Münster Cathedral’s interior is the magnificent astronomical clock, made in 1540-43. Not surprisingly for such a complex and beautiful machine, the clock was a team effort: printer Theodor Tzwyvel and Franciscan friar Johannes Aquensis made the astronomical calculations; wrought-iron craftsman Nikolaus Windemaker took care of the metalwork; Ludger tom Ring painted it in exquisite detail; and Johann Brabender probably sculpted the figures. At the top of the clock are small, animated figures. On the right are Death and Time, who strike the quarters of the hour. Death holds the arrow of death in his left hand and a hammer in his right; Chronos has a sickle of destruction and turns his hour-glass at every stroke of the bell. On the left side are those responsible for striking the full hour. The Tütemännchen (“little blower”) sounds the hours on his horn while the woman at his side matches each note with a ring of the bell. The beautifully painted clock face features the symbols of the Four Evangelists in the corners. Each holds a scroll with a Latin verse that mentions aspects of the clock while also representing four phases in the life of Christ. The scroll of the winged man (Matthew) reads: “Behold there came wise men from the east” (Incarnation); the winged ox (Luke): “There was a darkness over all the earth (Crucifixion); the winged lion (Mark): “They came unto the sepulchre at the rising of the sun (Resurrection); the eagle (John): “Are there not twelve hours in the day?” (Ascension). 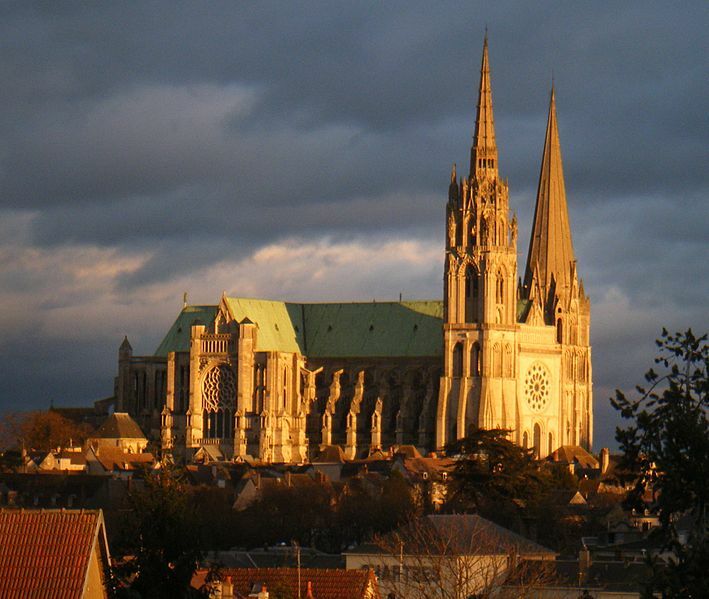 Chartres Cathedral, is a medieval Roman Rite Catholic cathedral located in Chartres, France, about 80 kilometres southwest of Paris. It is considered one of the finest examples of French Gothic architecture and is a UNESCO World Heritage Site. The current cathedral, mostly constructed between 1194 and 1250, is the last of at least five which have occupied the site since the town became a bishopric in the 4th century. The cathedral is in an exceptional state of preservation. The majority of the original stained glass windows survive intact, while the architecture has seen only minor changes since the early 13th century. The building’s exterior is dominated by heavy flying buttresses which allowed the architects to increase the window size significantly, while the west end is dominated by two contrasting spires – a 105-metre (349 ft) plain pyramid completed around 1160 and a 113-metre (377 ft) early 16th-century Flamboyant spire on top of an older tower. Equally notable are the three great façades, each adorned with hundreds of sculpted figures illustrating key theological themes and narratives. Since at least the 12th century the cathedral has been an important destination for travellers – and remains so to this day, attracting large numbers of Christian pilgrims, many of whom come to venerate its famous relic, the Sancta Camisa, said to be the tunic worn by the Virgin Mary at Christ’s birth, as well as large numbers of secular tourists who come to admire the cathedral’s architecture and historical merit. One of the few elements to survive from the mid-12th-century church, the Portail Royal was integrated into the new cathedral built after the 1194 fire. The central door was only opened for the entry of processions on major festivals, of which the most important was the Adventus or installation of a new bishop. The harmonious appearance of the façade results in part from the relative proportions of the central and lateral portals, whose widths are in the ratio 10:7 – one of the common medieval approximations of the square root of 2. 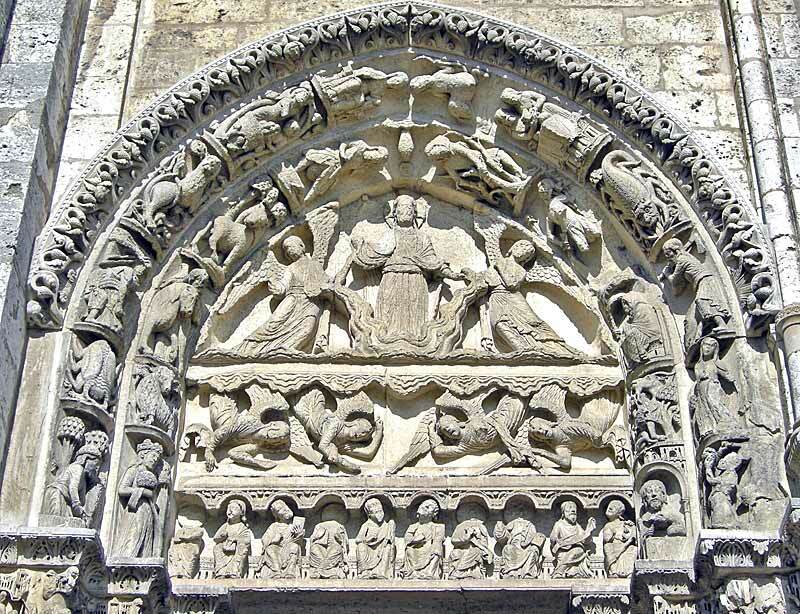 As well as their basic functions of controlling access to the interior, portals were the main locations for sculpted images on the gothic cathedral and it was on the west façade at Chartres that this practice began to develop into a visual summa or encyclopedia of theological knowledge. The three portals each focus on a different aspect of Christ’s role; his earthly incarnation on the right, his second coming on the left and his eternal aspect in the centre. The left portal is more enigmatic and art historians still argue over the correct identification. The tympanum shows Christ standing on a cloud, apparently supported by two angels. Some see this as a depiction of the Ascension of Christ (in which case the figures on the lower lintel would represent the disciples witnessing the event) while others see it as representing the Parousia, or Second Coming of Christ (in which case the lintel figures could be either the prophets who foresaw that event or else the ‘Men of Galilee’ mentioned in Acts 1:9-11). The presence of angels in the upper lintel, descending from a cloud and apparently shouting to those below, would seem to support the latter interpretation. The archivolts contain the signs of the zodiac and the labours of the months – standard references to the cyclical nature of time which appear in many gothic portals. In the ambulatory a stained glass window contains the twelve signs of the zodiac. On top in a four leaf clover, hence representing a form of cross, Christ is depicted in between the Greek letters alpha and omega. Donated by Thibault VI count of Chartres, in 1217, on behalf of Thomas count of Perche, this window illustrates the signs of the zodiac on the right hand side of the window, and the labouirs of the months on the left hand side. The four central quatrefoils are split between the months and the zodiac. The upper part of the window contains a central quatrefoil of Christ in Majesty, below and on the left are panels depicting December, November, and September, and in the lower central quatrefoil is October. The right hand side of the window contains the zodiac signs of Capricorn, Sagittarius, and Libra, and in the lower quatrefoil is the sign of Scorpio. This next section contains on the left hand side panels depicting the months of August, June and April, July being in the central quatrefoil. On the right hand side are the zodiac signs of Virgo, Cancer, Taurus, and in the quatrefoil is Leo. The central quatrefoil depicts the month of May in its left hand side, and the next two panels on the left depict March, and February, whilst January is shown in the bottom quatrefoil. On the right we have Gemini in the top quatrefoil followed by Aries and Pisces, whilst the bottom quatrefoil contains Aquarius. The chancel screen includes, on the south side, an impressive astrological clock dating from the 16th century. It told not only the time but the day of the week, the month of the year, the time of sunrise and sunset, the phase of the moon and the current sign of the zodiac. Its inner works were partially destroyed in 1793. 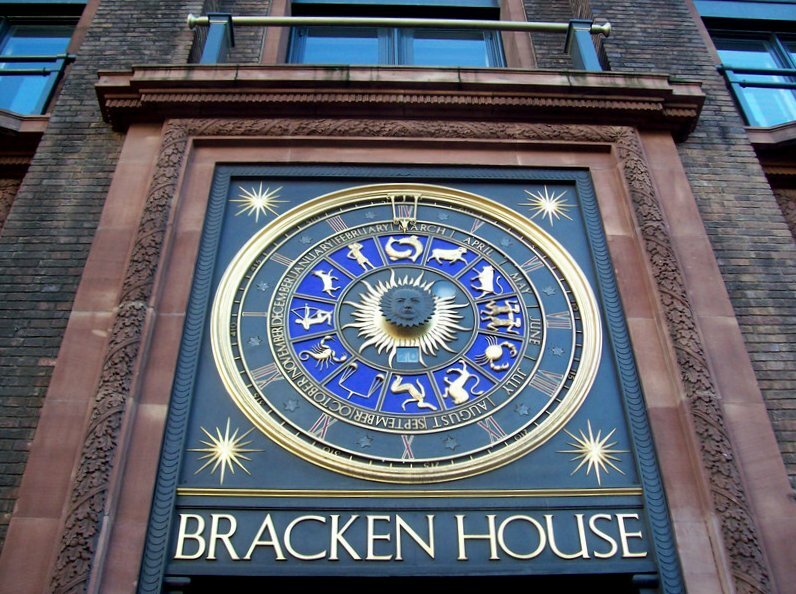 Bracken House is named after Bernard Bracken, former chairman of the Financial Times, which was published here until the 1980s. The building was among the first post-war buildings in the City to be listed and its redevelopment retained the entire outside facade, including the elegant astronomical clock approximately 1 metre in diameter bearing at its centre a face of Winston Churchill, a personal friend of Bernard Bracken.